Circle S Riding Stables, hunting, fishing and horse riding in New Mexico. Initially established in 1974 by the Storey family siblings, (a sixth generation New MExican family) Circle S has been offering quality guided trips into the Pecos Wilderness for over 25 years. We will guide you through the stunning beauty of the Sangre de Cristo Mountain range in the Pecos Wilderness where you will see a wide variety of wildlife. Elk, deer, big horn sheep, turkey, bear, and mountain lions roam this region. Don`t forget to bring your camera, there are endless opportunities to photograph! 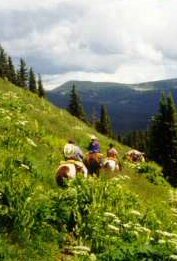 The stables are located at 9,000 feet altitude. 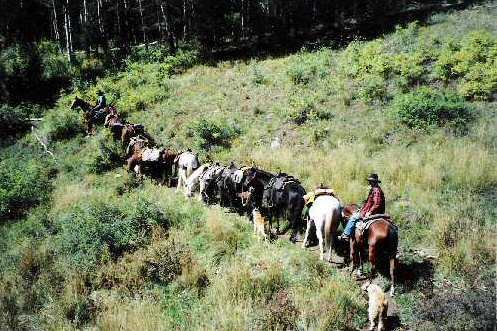 All of our rides are in the Pecos Wilderness. We are a small stable so our group sizes are limited. Our average ride size is 6 or less. We have been in this business since 1974. During our years of operation we have met wonderful people and helped to create lasting memories for our customers. 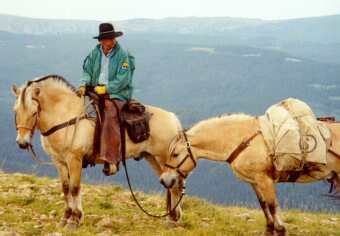 Our horses go to winter pasture the end of October. We open again for Memorial Day weekend. Our guide or wrangler accompanies you on your ride and makes every effort to ensure your ride is safe , enjoyable and informative. If you wonder about the name of a particular plant or how to catch fish, he`s there to tell you. We hope you may give us the opportunity to share the Pecos Wilderness with you. Whether you spend a few hours or a few days with us, we believe you will take some happy and lasting memories with you.